Before I show you how to make my 3 Ingredients Vegan Chocolate Bars with Almonds let me tell you a little about tempering chocolate. I haven’t used this technique for the chocolate bars but used it to make some chocolate eggs for the first-time last week. To my surprise this was much easier than I thought! 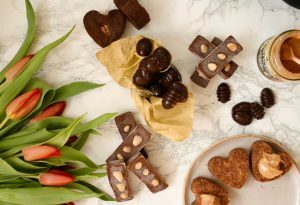 Time is key when tempering chocolate, you cannot rush it and need to follow the recipe’s instructions STEP – BY – STEP if you want your chocolate to have a beautiful shine and snap! 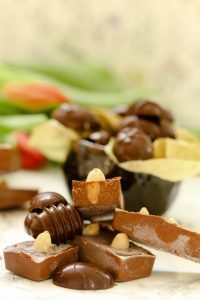 It is a slow process which consist in slowly heating the chocolate, and then slowly decrease the temperature of the chocolate before heating it up one more time. I followed the instructions and ended up with the most perfect chocolate eggs, they didn’t stick to their mould and would slowly melt into my mouth, a pure delight! All you need is a good quality chocolate, a thermometer … and some patience too! 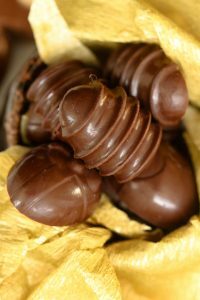 Here is the link on How to Temper Chocolate. Easter is the time of the year (after Christmas) which brings back beautiful childhood memories. My sister and I would go around the entire house and garden in search of chocolate eggs and sweet treats that our mum would have hidden. The hunt could last until bedtime, where I would find some more chocolate under the bedsheets 😊. To celebrate Easter, I wanted to share these easy to make 3 Ingredients Vegan Chocolate Bars with Almonds. Because the chocolate hasn’t been tempered, my chocolate bars did not have the shine of the chocolate eggs, instead they were super creamy! I added some blanched almonds in the middle of each one, this is a great contrast both in texture and taste. Less than 10 minutes! This all you need to make these easy and super creamy 3 Ingredients Vegan Chocolate Bars with Almonds. This will be the perfect treat for Easter along with some delicious chocolate eggs. A silicone tray makes it easier to push out the chocolate. Here is the one I have used, feel free to use another shape. Less than 10 minutes! This all you need to make these easy and super creamy 3 Ingredients Vegan Chocolate Bars with Almonds. On a baking tray, spread out the blanched almonds and bake at 180°C for 8 minutes. 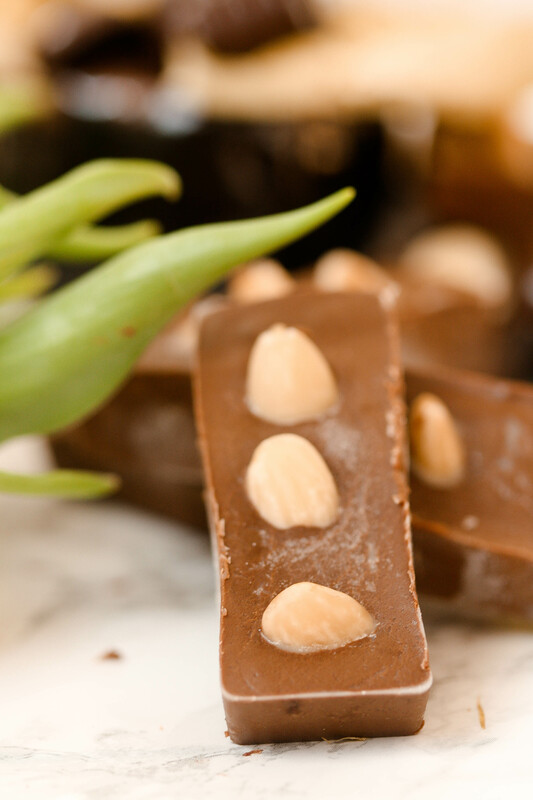 Take the blanched almonds out of the oven and let them rest on the baking tray while you prepare the chocolate. 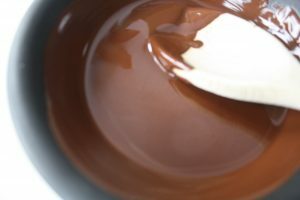 Stir from time to time, once the chocolate is melted remove the bowl and let it cool at room temperature for about 5 minutes before adding the coconut cream. Whisk the coconut cream into the melted chocolate. Pour the chocolate into your moulds. 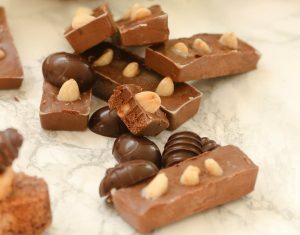 Let it cool at room temperature another 5 minutes and add 3 blanched almonds into each chocolate bar. Place the blanched almonds in a “standing position”. They are delicious when eaten straight out of the freezer. I would suggest you keep them in the freezer. I hope you try and like these 3 Ingredients Vegan Chocolate Bars with Almonds, if so let me know! Share on Pinterest and tag a photo on Instagram #mimies_delicacies so that I can see your lovely creations as well as helping me reach more of you lovely people. Merci my friends!